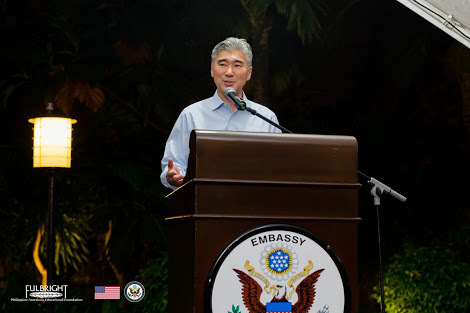 Ambassador Sung Y. Kim’s announced Php100 million ($2 million) in new U.S. government assistance through the United States Agency for International Development (USAID) to increase food security for communities affected by the Marawi conflict. This will enable USAID’s partner, the World Food Programme, to purchase a total of 1,800 metric tons of rice, enough to feed 45,000 people for four months. This brings the total USAID contribution to the recovery and rehabilitation of Marawi and surrounding areas to nearly Php1.2 billion ($22.9 million). USAID is the lead U.S. government agency for international development and disaster assistance. In the Philippines, USAID partners with the national government to build a more stable, prosperous, and well-governed nation. The event included a ceremonial rice handover from Ambassador Kim to senior Philippine government officials, including Undersecretary Emmanuel Leyco, Officer-in-Charge of the Department of Social Welfare and Development.